His voice was quiet, but the words were short and clipped. The teller was nervous and nearly passed out. She recovered and steadied herself by holding onto the counter. With quick, little birdlike movements, she filled the bag with money. He grabbed the sack. She watched him turn and slowly walk to the front entrance. She ducked behind the counter and pressed the alarm. The robber spun around wildly, fired his gun and dropped it to the floor. Everyone turned and stared at him. He panicked and bolted toward the revolving door. The streets were crowded. He paused, debating which way to go and opted for the center of the city. His indecision cost him valuable time. Sirens were blaring and the bank guards were incredibly close. He wasn’t in the best physical shape. But his long strides helped widen the distance between them as the guards were old and short-winded. “Halt,” one of the guards wheezed. Then, the guard leaned against the building as he stopped to catch his breath. Still, the robber sprinted down the street, jostling people and knocking some down. One hero made a flying tackle toward him, but missed. Undaunted, the hero picked himself up and chased the robber thru a parking garage toward an underpass to another street. Again, the hero leaped into the air. This time, he caught the thief about the waist and knocked him to the ground. The bag hung briefly in midair. Then it plummeted to the dingy corridor and the money flew in every direction in the hallway. The pair scuffled for a few minutes until the robber connected a roundhouse to his antagonist’s glass jaw. The robber quickly got up and fled toward the lunch-time crowd on the street. George winced, and hesitated too long before answering. Another piercing shriek from the ‘little woman’ penetrated the apartment’s thin walls. Slowly, he pulled himself up from his recliner and lumbered toward the kitchen. “Yes, my love,” he grumbled. Sometimes we blend right into the TV shows! There have been many times that I wish I could have teleported myself into the adventures on TV. Poor George. When I want to teleport myself into a TV adventure, I choose Rizzoli and Isles or NCIS. George needed an escape. Thanks for a terrific story! Thank you for your comments and for your persistence. George sounds like me when I’m into a very interesting movie and I had to stop cause it’s time to eat. I’m glad there’s cable feature that allows me to go back and watch again. Supper always a delicious treat though. Trying to get my attention when I’m reading the comics is tough. 😆 So I understand George’s focus needs to shift back to the real world. George’s motivation for leaving his comfy chair appears to take a back seat to the exciting movie he was engaged in. Great story, Judy! Sometimes escaping into the TV is the only break from reality we can manage without uprooting our whole lives. The illustration was great, too! Real life often does seem to pale when compared with cartoons, a great story line, adventure and intriguing characters. I understand George’s dilemma. Paprika, I’m glad you liked my story and Mark Armstrong’s illustration. I was delighted with his creative approach to my story. Is George the bank robber, the guard, or the hero? Or maybe he’s all three. I like the way you think, Charles. 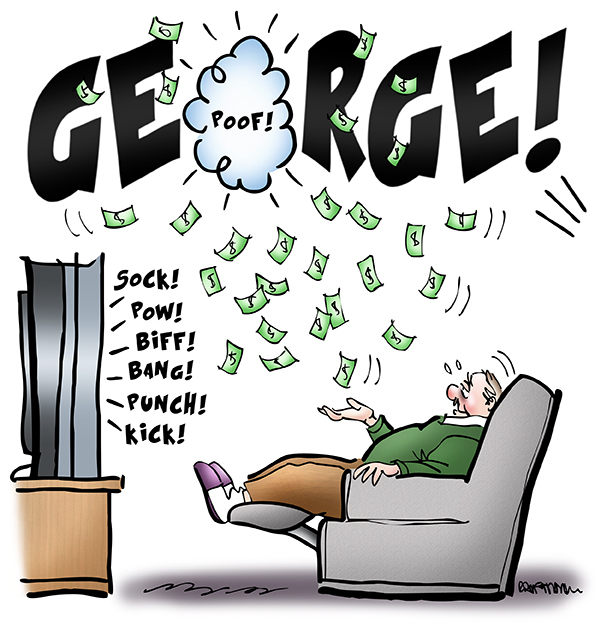 My intention was to have George’s role be ambiguous – was he the bank robber or just a passive TV viewer?. But I never considered that George might have been the hero or guard in this story. That really opens up possibilities … Intriguing. I often have such fantasies. In fact, I’m so suggestible, I helped George make the tackle while I was reading your delightful story. Move over James Thurber and Walter Mitty, you’ve got serious competition!! Mark … I am thrilled beyond belief that I have an “original Mark Armstrong illustration.” You nailed my story with one beautiful illustration. Thank you for your artwork and for the compliment on my story. I love the funny twist! Thanks for sharing your story and the perfect illustration. Thanks my storm-chasing friend. I also loved your video “The Chase.” I’ll pass along your compliment on the illustration to Mark Armstrong, a fellow WordPress blogger. His illustration is perfection. Poor George. Still, the television has its uses…. You’re right, Kate.Sometimes a get-away is not an escape though. Lisa …I do hope that you write about and post photos about Peru. Like you, I’m not up for catching malaria. Glad you liked George’s story. Delighted you got caught up in the action, Madhu.